I don't usually write about non-technical things on this blog, but for once I will be describing my holiday adventures. A week and a bit ago I returned from a week long trip to Edinburgh and Speyside to get up and close with some of my favourite products: Scotch Single Malt Whisky. I think that I managed, as during the week I probable tasted around 50 different whiskies. Some of that was on our own accord at Albanach in Edinburgh, but we also participated in a three day Whisky tasting tour with Rabbie's Trail Blazers in Speyside, home to more than 50 distilleries. But before we embarked on the boozy tour, we spent some time in Edinburgh. I love the city. 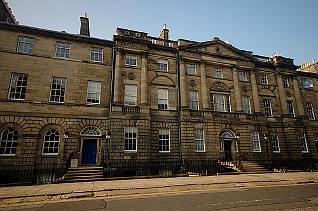 Although I have been to Edinburgh before, I had never visited many of the tourist attractions. So this time we went out and visited the National Trust property Georgian House on Charlotte Square, the Royal Yacht Brittania, and the Royal Botanic Garden Edinburgh. In the evenings we tried many many different whiskies at Albanach (a list will follow at the end). On Wednesday morning Morag and I turned up on the Royal Mile for our whisky tour. The nature of this tour had me slightly worried that we would be the youngest couple by far, but that turned out not to be too much of the case. We left in our small bus (16 people) and just after lunch in Dunkeld we stopped at The Hermitage (OSM) to stretch our legs. We went then onwards to our first distillery: Dalwhinnie. Dalwhinnie is run by Diageo and the visit had a bit of a corporaty feeling to it. Our guide was alright and managed to explain the basics of how a distillery works. We tasted four different Dalwhinnies. After Dawhinnie we headed for Grantown-on-Spey where we would stay for two nights at Dunallan House, a lovely bed and breakfast with a friendly host. We had pie for dinner at The Craig Bar (they only do pies), and after dinner we went for a stroll in Anagach Woods along the river Spey, followed by a few drams at the Garth Hotel. The following morning we got up early for a 9:30! tour of the Benromach distillery. This tour of one of the smallest distilleries was led by a veteran whisky maker with an unbelievable amount of knowledge about whisky making. Not only was the tour itself excellent, the gentleman also talked us through the whisky tasting instead of just giving us four whiskies. Morag ended up buying a Benromach Origins Batch 4. After lunch our next stop was at the famous Gordon and MacPhail shop in Elgin. They are actually the owners of the Benromach distillery as well. The shop is mostly known for their own special bottlings of whiskies. I ended up buying a bottle of a bottling of an Imperial. This distillery is now closed, and has had its buildings demolished. I still have to try it. In the afternoon we visited another distillery, Cardhu. It is, like Dalwhinnie, also owned by Diageo and sometimes called "the heart of Johnnie Walker". When we came to the spirit still during our tour, we noticed that there was a liquid spurting out of one of the stills. And with this being our third tour, I didn't think that was supposed to happen. After notifying our guide, she quickly called maintenance which came hurrying to investigate. After seeing the leak for themselves they fetched some putty to plug the whole—whisky saved! It later turned out to be the head, so no whisky-in-the-making was actually lost. However, both the tour, and the whiskies that we tasted were underwhelming—especially after our earlier tour and tasting at Benromach. In the evening we struggled finding a place to eat in Grantown on Spey and ended up having a curry at Sylhet. After dinner we had a nice long walk in the woods North of Grantown on Spey before retiring to the Craig Bar for a little dram before bed time. On our last day our first stop was at the Glenlivet distillery. Another large distillery—the best selling in the US and the second best selling globally. 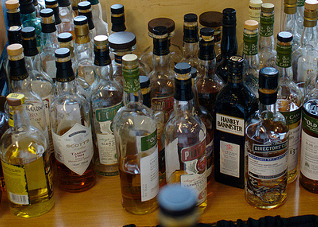 The tour was good and instead of a tasting measure of whisky, we received a generous dose. For a few quid we also ended up tasting the more exclusive Glenlivet 21. The next stop was the Speyside Cooperage, a company that refurbishes and repairs casks. It is quite fascinating to see how coopers go about their job, but it was not nearly as impressive as our next stop on the tour: The Whisky Castle. Hidden away in the tiny town of Tomintoul, the Whisky Castle has a decent range of whiskies, but it is more impressive that the proprietor selects his own casks to bottle. And he doesn't mind letting you taste his own selections... After six tastings I ended up leaving with two exclusive bottles and a very good mood. 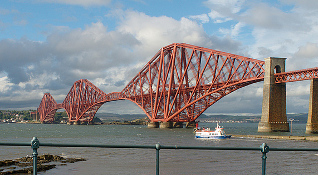 After a quick photo-op of the Forth Rail Bridge we made it back to Edinburgh. On our last day we hoped to see the pandas and Edinburgh Zoo, but with Tian Tian pregnant, and Yang Guang ill that didn't work out. We still had a good day out seeing lots of animals. We met up with Michael for dinner at Cafe Marlayne where I'd eaten before. Although the food is great, the behaviour of their staff was not really acceptable this time. Doubt that I'll return. On the last day we visited another National Trust property right on the Royal Mile, Gladstone's Land. Some retail (whisky) therapy, a last drink at Albanach, and a climb up Calton Hill marked the end of the holiday. The photos of this trip can be found on flickr. I have tasting notes for most of those, but that will have to wait until a new post. Slàinte!